July 03, 2016 was a significant day for the alumni of Sri Sathya Sai Educational Institutions. 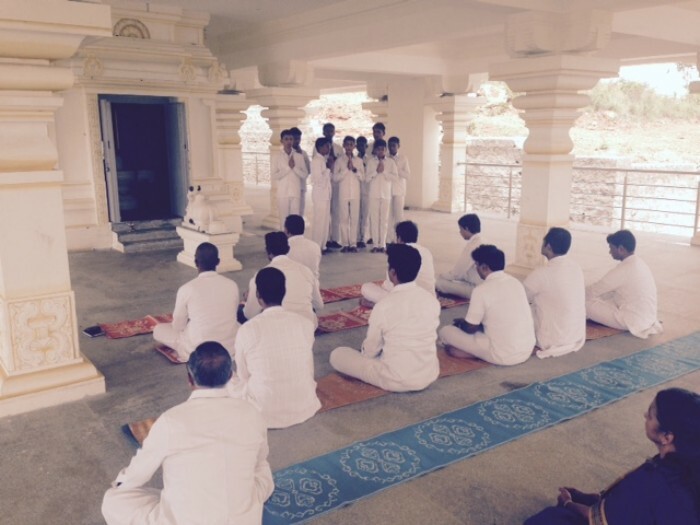 The first ‘Campus Alumni Cell’ was inaugurated at the Sri Sathya Sai Sharadaniketanam campus in Mandya. The location for the auspicious start to the initiative was the magnificent Shiva temple or Dhyana Mandira as it is called. Coincidentally, that day also had a group of alumni from Bangalore visit the campus to witness firsthand Swami’s continuing educational mission in the remote corners of the state and explore opportunities to engage in the campus on a ongoing basis – A mandate that our dear Lord has given us – His alumni and alumnae. Brother Sai Prasad, a senior alumnus of Muddenahalli represented the alumni based in Mandya on this day. The Campus Alumni Cell is a initiative to create a platform for the campuses and the alumni/alumnae to connect and engage with each other. For many years now, there has been a felt need for a platform of this kind. On June 05, 2016 while guiding the alumni planning retreat team, Swami specifically picked the Campus Alumni Cell as a critical initiative and wanted it implemented immediately. Swami, in fact, wanted the initiative to be driven directly by the Chairmen in each of the campuses. It is no coincidence that Mandya turned out to be the first campus to setup the alumni cell. Even before any discussions on the alumni cell platform had started, the visionary team of Sri Ananthmurthy, Sri Jayaram Reddy and Sri Vinaybhushan had started encouraging greater involvement of the alumni community in the campus. The July 03, campus visit by the alumni was in fact the first event that the alumni cell coordinated and was considered a grand success in creating a deep bond between the alumni and the campus and paving a path for a long term association, one of transformation and one of creating opportunities for many to be a part of His mission.